"Also tonight, a warning from the President," she teased Friday's CBS Evening News before a clip of Obama with a very suspect claim: "If we don't get health care reform done now, then no one's health insurance is going to be secure." Couric introduced the story by portraying Obama as the hero trying to reach a noble goal: "President Obama today continued his hard sell for health care reform, but he also had to do a little doctoring, treating a case of sticker shock over the latest proposals for insuring nearly every American." Chip Reid related that "with anxiety surging over the cost of health care reform, the President today sought to reassure the public and nervous members of Congress" a day after the CBO director "sent shock waves through Capitol Hill." Over on NBC, anchor Brian Williams at least accurately painted Obama as on the defensive with a "hastily-scheduled" public appearance after 4 PM EDT on a Friday: "One day after the Congressional Budget Office said a Democratic health care reform plan would actually cost money instead of saving it, President Obama put together a hastily-scheduled appearance at the White House for a pep talk." Kelley O'Donnell explained "signs of trouble for his health care overhaul" led him to deliver "that quick speech with a stern and unwavering message for Congress." KATIE COURIC: In Washington, President Obama today continued his hard sell for health care reform, but he also had to do a little doctoring, treating a case of sticker shock over the latest proposals for insuring nearly every American. Here's our chief White House correspondent, Chip Reid. CHIP REID: With anxiety surging over the cost of health care reform, the President today sought to reassure the public and nervous members of Congress. OBAMA: Health insurance reform cannot add to our deficit over the next decade and I mean it. REID: His statement comes one day after a congressional budget director sent shock waves through Capitol Hill with testimony that the bills now working their way through Congress would send spending on health care soaring. DOUGLAS ELMENDORF, CONGRESSIONAL BUDGET OFFICE: The legislation significantly expands the federal responsibility for health care costs. REID: That's exactly the opposite of what the President has repeatedly promised, that health care reform will bend the long-term cost curve downward. A promise he repeated today. OBAMA: The bill I sign will also include my commitment and the commitment of Congress to slow the growth of health care costs over the long run. REID: But Republicans say the budget director's prediction that the cost curve will go up means the Democrats' plan will break the bank. Many Democrats are worried, too. About three dozen first-term House Democrats today voiced their concerns about cost in a meeting with chief of staff Rahm Emanuel, a meeting the President dropped by. Members in the meeting say President seemed open to suggestions but was adamant about passing it this year. 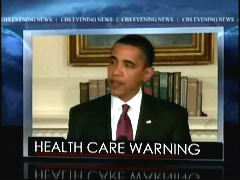 OBAMA: If we don't get health care reform done now, then no one's health insurance is going to be secure. REID: In another effort to try to keep control of the health care debate, the White House announced today that the President will hold a prime time news conference next Wednesday. Katie? BRIAN WILLIAMS: Some of the intensity of last night carried over today to the President's push for health care. One day after the Congressional Budget Office said a Democratic health care reform plan would actually cost money instead of saving it, President Obama put together a hastily scheduled appearance at the White House for a pep talk. On Capitol Hill. Correspondent Kelly O'Donnell with us tonight for more on this. Kelly, good evening. KELLY O'DONNELL: Good evening, Brian. Clearly the President wanted to get in the last word of the week after he could see there was new resistance and signs of trouble for his health care overhaul, so he added that quick speech with a stern and unwavering message for Congress. Now the issues are basically cost and time. It really set off alarm bells when the Congressional Budget Office said that the plans would increase spending, not reduce it. And today, key Democrats and Republicans - moderates the President needs - made a direct appeal to the White House asking for more time to resolve these differences. But as you'll hear, the President's answer was a definite no. PRESIDENT BARACK OBAMA: Those who are betting against this happening this year are badly mistaken. We are going to get this done. We will reform health care. It will happen this year. I'm absolutely convinced of that. O'DONNELL: And Brian what happens here next week will be critical in this debate because the differences are still so wide. The President did soften a bit acknowledging this is tough work, but he is not yet ready to budge on some of the issues that Congress thinks are most important right now. Brian?